The Canon Lion City Cup 2011 kicked off with a great bang, a great match, end to end action till the last 5 minutes of injury time, bringing back the Singapore supporters roar into the Jalan Besar Stadium. This was the opening match between Newcastle Under-15 and Singapore Under-15. Even though they were kids, under the age of 15 playing with each other, they definitely live up to playing attacking flowing football, with beautiful passing and shots on goal, with the usual footballers’ mistakes that were committed in the match (even by professional footballers). Lots of shouts, ooh, ah, words, encouragement, cheering and singing, the atmosphere was great, almost back to the days of Malaysia Cup! These boys gave us a great spectacle to watch and something to cheer them for, the passion and love for football rekindled. Singapore U15 boys played like Lion Hearts, not intimidated by their counterparts from Newcastle, England, bigger in size and height, they fight for the football and played their guts out, encouraging the fans at Jalan Besar Stadium to cheer for them even louder and more passionate, and in turn, encouraging them to play even better and harder when the chips were down at 3-1, odds against the local boys. The never-die Lion Hearts inside them, with tactical substitutions playing a key role, with the super-subs, making the comeback complete with a final score of 4-3 after 5 minutes of injury time played! When the boys equalised and leveled the scoreline at 3-3, the stadium stood up and cheered for the boys loudly, lots of singing and cheering, you can see the teamwork and comradeship inside them, running towards the bench to celebrate with their other team mates, coaches and support staff. The unity and unison, the huddle and group celebration, demonstrated their togetherness and team spirit. 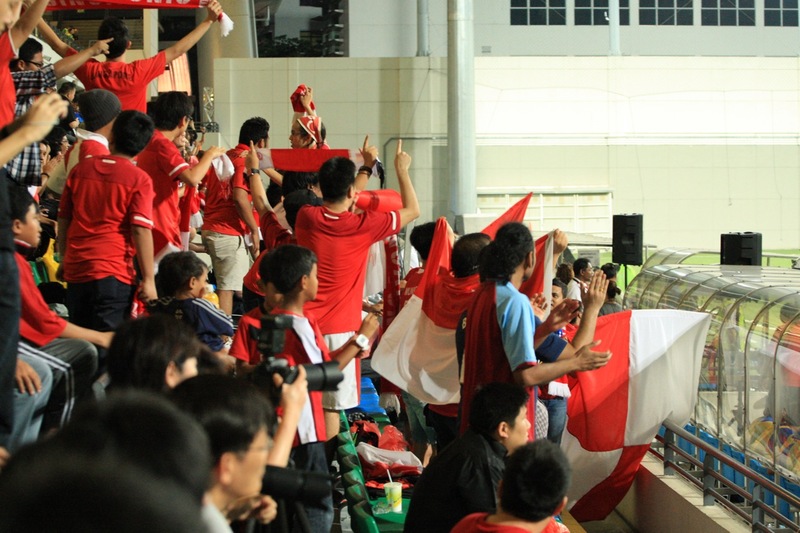 At the final minute of injury time, when the winning goal was scored by the Singapore boys, it was the euphoria that sent the entire stadium into eruption of joy and emotions, the boys celebrating together on the field, simply ignite the stadium even further. A great game, a great start, if you think watching the Singapore U15 boys would not be fun or exciting, do drop by their games during the Canon Lion City Cup and be amazed, mesmerised and motivated by them, to cheer and support local football again! Good luck to the Singapore U15 and U16 teams and Go Singapore! Celebrating Singapore’s Social Media Day 2011!